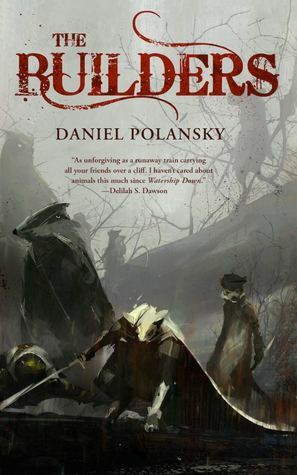 The Builders is a new novella by Daniel Polansky. It looks at a world populated by anthropomorphic animals – but not the cute kind from children’s TV. These animals live in a world reminiscent of the Old West – filled with sharpshooters, gunslingers, and a certain fluid morality. But the creatures that the narrative follows aren’t exactly heroes – or if they are, it’s an especially specialised definition. The world of The Builders is one which presents sharp features, pared down to the essentials. There’s some talk of events “South of the Border”, and the driver for the initial events is the replacing of one entrenched oligarch with another. As a whole, however, the feel is, deliberately I assume, one of a spaghetti western. There’s a sense of emptiness about everything – the geography attuned to the characters that inhabit it. Polansky writes some wonderfully evocative prose; the bar where the characters find themselves is dingy, dangerous, and dusty – and each of those attributes becomes clear with an elegance of phrase which was delightful to read. The world is economically described, but, perhaps due to this, feels alive. Each gunshot, each floating particle of dust before a storm of gunfire, comes together in a world where violence pervades everything, and each interaction has the potential to be fatal. Polansky is a master of atmosphere, letting the world exude atmosphere onto the reader, showing, rather than telling. The world he creates is familiar if you’ve ever seen or read a western, but skewed sufficiently to skew and subvert expectation. Something similar may be said of the characters. They’re a motley and terrifying crew, some recognisable as derived from western archetypes, others a mix of traits or something entirely individual within a broader genre brushstroke. As an example, I was particularly fond of the infiltration specialist who spoke with a broad French accent. There’s gunslingers, schemers, and trained killers – and each of them has enough character to differentiate them. Polansky also manages to use the different species of the characters as a shorthand for character traits, physical and mental; a mole, for example, is nearly blind, but also rather good at digging holes – which they acerbically remark on as not being the only thing they’re good for. Each of the characters is distinguishable, and carries some personal and species-appropriate quirks – which make each member of the crew memorable for the reader. From the one-eyed mouse with the air of barely supressed rage that is the Captain, to the towering hulk trying to escape from their own affection for mass murder that is the Badger – they all feel, if not human, certainly real. The narrative, like the world and the characters, is a marvel of simplicity. At root, it’s a tale of revenge. The Captain gathers together the survivors of a crew that helped him win aa war - and then lose it again – and sets out to wreak vengeance on those who caused his current situation. The others sign on for varied motives, but that’s the common driver – all were hurt, and all are looking for something between peace and bloody revenge. Mostly the latter, if I’m honest. The text barrels toward a climax with a pace I’d describe as relentless. It never lets the reader off the hook, and the lulls between scenes seem more like pauses to reload than moments of quiet reflection. There’s some excellent character scenes here, especially in what they convey given their brevity, and they’re bookended with some first-class action, and some twists and turns in the plot which were rather shocking. I’ve always thought Polansky was one of the more underrated authors in fantasy today, and he’s proven his quality again here. If you’re in the mood for a fantasy-western hybrid, which embraces tropes from both, but remains unrepentantly original, then this is absolutely worth your time.